A well-written, comprehensible assessment of the 1929 stock-market crash. Klein (The Life and Legend of E.H. Harriman, 2000, etc.) is a seasoned business historian, and he humanizes a potentially dry subject, capturing how the rapid post-WWI transformations affected both average Americans—who, as “minnows,” were seduced by the market—and the powerful cabals that ran “the Street.” Although the dark chaos of October 1929 provides the center here, Klein reconstructs the halcyon days preceding the crash, the ethos of greedy naïveté, which may have caused it, and its relationship to the worldwide depression that followed. He is adept at explaining complex business ideas (such as covert stock pools and the bearish tactic of “selling short,” both of which were factors in the crash) in terms that convey the gravity of what followed 1929’s “Summer of Fun.” He builds toward the climactic disaster via scrupulous readings of primary sources, and strengthens the milieu by depicting many of the era’s most significant industrial and cultural figures, such as Henry Ford and Aimee Semple McPherson, as well as the Street’s many gold-plated gurus, from Sunshine Charley Mitchell of the National City Bank to the famous stock-tipping bootblack Pat Bologna, some of whose shady tactics undeniably contributed to the final panic. 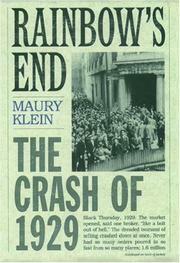 Of the Great Crash itself, which began on Thursday, October 23, and continued through Tuesday, Klein notes that “the selling wave seemed irresistible . . . frightening holders into ‘selling at the market’ ” (at any price), while technology was overwhelmed by human fallibility, with stock tickers running over an hour late. Throughout, as Klein ruefully observes, one cannot miss the glaring similarities between Hoover’s pro-business “New Era” and our own recently hobbled, high-tech “new economy,” such as the irrational exuberance demonstrated in both eras by an uneducated investing public. Klein is an elegant (if detail-obsessed) constructor of business histories, and one can read dire warnings between the lines here. A most timely business narrative.